At times, Lombard Street is like any ordinary San Francisco Street, running through some of the older neighborhoods such as Cow Hollow and Telegraph Hill. It begins in the Presidio at Presidio Boulevard and ends in the Embarcadero. 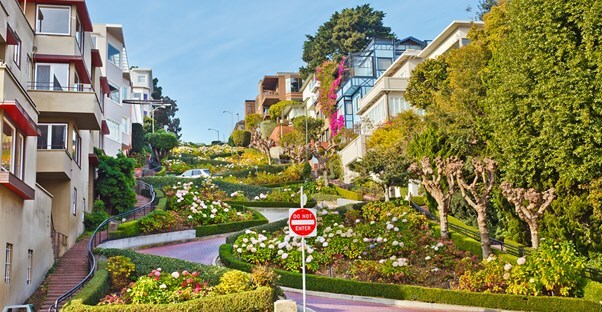 However, along the way, a famous strip of Lombard Street known for the steep one-way block on Russian Hill below Hyde and down to Leavenworth, awaits with eight hairpin-sharp turns that snake a path down the hill. This famous stretch has become a San Francisco Icon, appearing on countless postcard, t-shirts, and souvenirs. Many viewers and drivers have claimed the steep descent on Russian Hill as the world's most crooked road. The present form of the street as an eastbound one-way street dates to 1922. Mindful of its use as a tourist attraction, a city traffic commission reduced parking on the street and converted it into a one-way passage with maximum use of the road space for driving, and maximum visibility without parked cars. The San Francisco Department of Public Works maintains the street, and they have beautified the twisting street with lush landscaping. A posted speed control warns of winding turns and adds a 5 mph speed limit. It is a scene more expected in the Alps or in some European Village carved from a mountainside, but it is a spectacular addition to San Francisco’s distinctive Russian Hill neighborhood. It is a tourist attraction of some significance, and tourists visit the challenge on foot as well as by vehicle. The Powell-Hyde cable car stops at the top of this block. The block descends at a 27-degree angle, and the designer installed hairpins turns to increase safety by decreasing the angles of descent and making it easier to control speed present in a straight descent. It is not only a challenge for cars; it is also difficult to walk the slopes since most streets rarely approach a 5-degree incline. People wish to visit Lombard Street in the Russian Hill District to see the astounding crookedness and steep decline. The area is also quite appealing for its older homes, and it has been a featured location in a large number of movies. It is instantly recognizable and with the remarkable shape, is quite a beautiful area particularly in the spring and summer when blooms, flowers, and greenery line the winding avenue. Visitors photograph the street frequently with scenes of slow moving cars and similarly slow moving pedestrians. Whether ascending or walking down the hill, each step is remarkable for its difficulty. Be careful when you reach the bottom of the hill in your car as numerous tourists stand in the street taking pictures of themselves in front of the iconic backdrop. Though a little out of the way of other attractions, Lombard Street at Hyde is on a cable car route that goes into the Embarcadero District. On the cable cars, it is only a short ride to the Embarcadero, its restaurants, and amusements. It is conveniently near the fabulous San Francisco nightlife destinations and entertainment venues. The world famous seafood of Pier 45 and Major League Baseball are both part of the Embarcadero area.